"You know people," she argued. "You have a way of getting inside their heads. Nothing ever surprises you. ""You do," he murmured. "Continually. 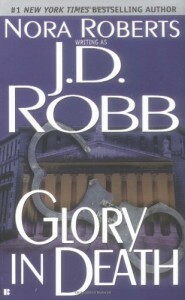 "I wasn’t supposed to read this one just now but once I finished “Naked in death” I wanted to see how Eve and Roarke relationship was evolving so I opened “Glory in death” to read the beginning and got sucked in. Like with the previous one, the book is centered on the police investigation who is, except for the end that I found rushed, well written. Here again, I enjoyed the secondary characters (Mavis, Commander Whitney, Feeney and the new Chief). But what really gives this series its special touch for me is Eve/Roarke relationship and in my opinion there isn’t enough of Roarke.